Hi! This will be quick because I'm kind of on the way out the door. My friend Kelley and I are starting an arts and crafts night, since we quit painting class. We used to take free adult painting classes but they were too serious, quiet, and everyone had already taken the class a number of times so we were the new kids. Plus we're young. It was a class full of mad, mean, old ladies who came an hour early to make sure no one took their spot and forced us to either sit on the floor or work in the back behind them where we couldn't see the model. Not too fun. So we're trying to do a weekly arts and crafts night instead. Tonight I wanted to bring cookies, and one of the girls coming is a vegan. I brought in a birthday cake a week ago to work and she couldn't have any because I'd used eggs, so to make it up to her I wanted to make something to bring tonight that she could eat. Plus I wanted cookies. I wanted to make chocolate chip ones but I don't have any chocolate chips, so instead I made cinnamon-sugar cookies, which are delicious. And good for everyone to eat! This is a gluten-free, stripped down version of this recipe. Use it and put whatever you want in it, chocolate chips, nuts, cinnamon and sugar, peanut butter, cocoa powder, whatever you want. I added almonds. Mix the first 4 ingredients and cinnamon, if using. In a separate bowl, combine the butter or shortening and sugar. Mix in the soy milk and vanilla. Combine wet ingredients with dry. Add nuts, chocolate chips, raisins, dried fruit, or whatever you want now. Roll into quarter-sized balls and place on a cookie sheet. Flatten with your fingers, sprinkle the tops with sugar, and bake for 5 minutes at 350, turn the pan, and bake another 4 minutes. 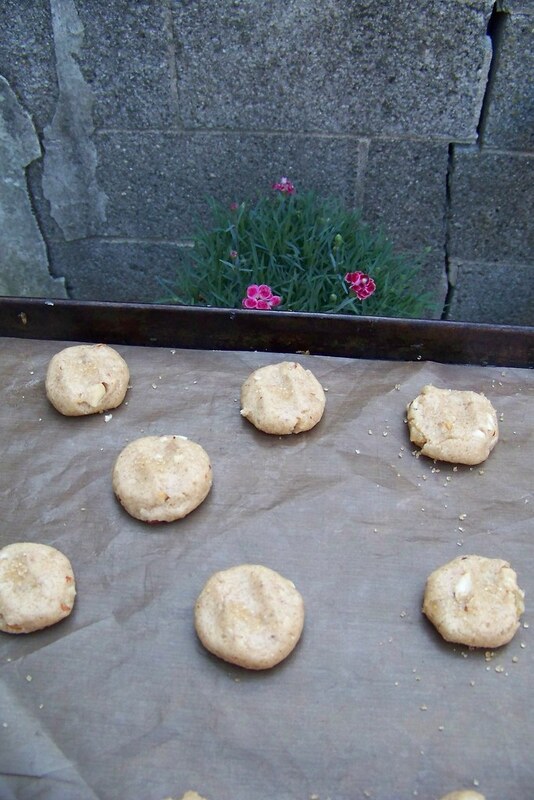 I just posted a vegan, gluten-free Sesame-Ginger cookie recipe you might want to try out sometime. It's also kind of artsy looking with black sesame seeds and Turbinado sugar crystals on top. Hey, I was about to embark on the Oreo recipe, but then thought I might try Smitten Kitchen's molasses spice cookies instead. I'm baking them gluten free for a friend, and I've never tried it before. Anything different about cooking time or cookie spreading, etc? Do you need to add extra baking powder or anything like that? rachel - those look great! I added your blog to my list on the side. Jemima - cookies are tricky. I'm still figuring them out. Do you have a good flour blend? I would suggest adding about 1/2 t xanthan or guar gum if your flour mix doesn't have it already, and a little more baking powder. I would also suggest using half vegetable shortening sticks (like crisco) instead of all the butter, but if you don't refrigerate the cookies for a while before baking. I've had some trouble with cookies with a lot of butter spreading. Goodluck, and let me know if you need any more help! !